HELSINKI, FINLAND--(Marketwire - February 3, 2011) - New mobile broadband research, commissioned by Comptel Corporation (NASDAQ OMX Helsinki: CTL1V), the leading vendor of dynamic Operations Support System (OSS) software, has revealed that more than three in five consumers are now ready and willing to pay for a higher quality of experience (QoE). Seventy-four percent of respondents who are willing to pay for a higher QoE said that they are prepared to spend more money just for faster download speeds. Further to this, 61 percent of respondents indicated that they want their communications service providers (CSPs) to offer bespoke service and price plans that are based on their individual broadband consumption habits. At the same time, consumers want these plans to be simpler; more than four in five respondents prefer to have just one bill or data plan that covers all of their broadband access needs. The study, which was executed by independent research firm Vanson Bourne last month, polled 2000 consumers from across the United Kingdom, France, Germany and United States on their mobile broadband usage and their satisfaction with CSPs' service plans. The research report will be available at Comptel's booth at Mobile World Congress (Hall 1 at Stand 1C06). "Eighty-seven percent of consumers see QoE as the driver that will influence their allegiance to their CSP, and the majority of them would not only move but also pay more money for faster and personalized services," said Ms. Arnhild Schia, senior vice president, global alliances and strategic marketing, Comptel. "This consumer-driven demand for a better mobile broadband experience is a tremendous revenue opportunity for CSPs. Policy and charging control can help them optimise QoE -- smoothing data usage more evenly across their networks, while dynamically adapting and simplifying service bundles based on individual customers' wants or needs, and introducing progressive pricing strategies that monetise this consumer demand." Mobile broadband has become a part of everyday life. Approximately two-thirds of the consumers surveyed in the U.K., France and U.S. reported accessing the Internet most frequently from smartphones. An exception was Germany, where laptop dongles were the most popular mobile broadband-enabled device, with 56 percent of consumers utilising them. In France, personal navigation services (GPS) were a popular broadband access device, with 47 percent of consumers utilising them. There is a clear trend towards multiple broadband connections. Fifty-eight percent of respondents already have two or more broadband connections, and of those, four percent have four or more connections. Three in five respondents added an additional broadband connection in the previous 12 months, and three quarters of the 18-25 age bracket have added at least one mobile broadband connection in the last year. There is a significant room for improvement in the overall broadband experience, and clear differences in consumers' wants and needs. Consistency in terms of quality of service, more flexible service and price options and unlimited data download plans are bigger issues in the U.K., France and Germany, respectively, than anywhere else. Almost a third of U.S. respondents said that improvements were needed all round. Male respondents are twice as likely to be dissatisfied with QoE as their female counterparts, and the U.K. is the hardest region to keep satisfied, with 26- to 35-year olds the easiest to please. Given access to unlimited broadband, regardless of location and cost, more than half of respondents would use the extra bandwidth to watch more online TV, especially in France. In the U.S., respondents reported a preference to staying more connected to family and friends. To learn more about Comptel's OSS solutions for mobile broadband, visit http://www.comptel.com/ComptelForMobileBB/. Comptel will be attending and exhibiting at Mobile World Congress, taking place 14-17 February in Barcelona. To arrange a meeting with the company or to receive a demonstration of its Comptel Dynamic OSS suite of solutions, please contact comptel.marketing@comptel.com or visit Hall 1 at Stand 1C06. 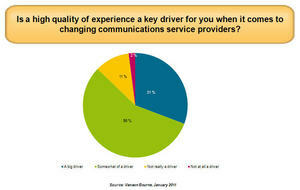 Nearly nine in ten consumers believe that Quality of Experience will influence their allegiance to their communications service provider.